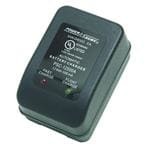 Switching Charger for 12V 2-5AH Sealed Lead Acid Batteries. The dual rate allows for faster charging at first, then a slower "float" charge when the battery is nearly recharged. This charger is well suited for the Power-Sonic 12V 6AH Sealed Lead Acid Battery.